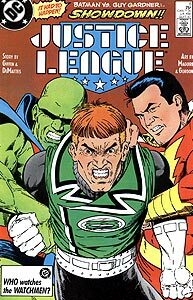 Brief Synopsis: After Batman knocks out Guy Gardner, the remaining Justice League responds to Dr. Fate's warning about odd happenings in Stone Ridge, Vermont. Issue Summary: The Gray Man harangues his prisoner, Doctor Fate, with the story of his origin as a magician who was forced to become an agent of the Lords of Order. As part of his revenge scheme, the Gray Man has enslaved the population of Stone Ridge, Vermont, which he plans to use to destroy mankind. Meanwhile in the Secret Sanctuary, Batman and Guy Gardner are arguing over leadership of the Justice League. When Gardner turns the argument into a fight, Batman bests him with one punch. In the aftermath, Doctor Fate contacts the League with a warning about the plans of the Gray Man. With jaw agape, Booster is present for Batman's conclusive response to Gardner's obnoxious attitude: "one punch." This event will resonate with the fans, and continue to be referenced for years to come. This is Booster's first trip inside Blue Beetle's Bug. Booster spends the trip wondering how much it cost to build. Booster is present with all of the active Leaguers save Captain Marvel when the League arrives in Stone Ridge and unexpectedly meets the Creeper. 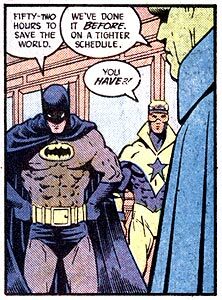 The unorthodox Creeper has a history with the League, with Batman once asking the League to investigate whether the Creeper was hero or villain (Justice League of America, Vol. 1, #70). After mere moments in the Creeper's presence, Booster renders his verdict of the Creeper: "Jerk." Boosterrific Review: "One punch!" This issue is far more memorable for the confrontation between Batman and Guy Gardner than for any participation by Booster Gold. Yet Keith Giffen and J.M. DeMatteis still manage to deftly incorporate Booster in the new role of newcomer amidst a team comically hell-bent on self-destruction (in the best possible way). A great issue if not a great Booster issue.